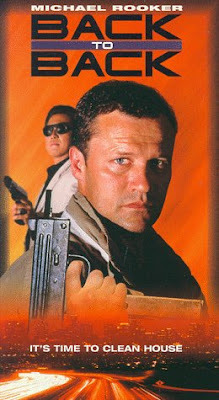 Bob Malone (Rooker) is an L.A. ex-cop who is having a very bad day. First his daughter mouths off to him, then some guy blocks in his car, and after that he gets into a battle with his local ATM. His Loan Officer (that’s his name, evidently) (Willard) won’t even give him any more time. To make matters worse, two Japanese gangsters named Koji and Hideo (Ishibashi and Takasugi, respectively) show up in town brandishing a mysterious suitcase. It seems they’re in the midst of a gang war with the Italian mafia, and thanks to the inadvertent intervention of a psychotic man named…well, Psycho (Goldthwait), the unlikely pair of Bob and Koji end up teaming up in the name of some sort of justice. But will Bob repair his relationship with his sassy daughter? And is there corruption that goes all the way to the top? The only way to find out is for Bob and Koji to get BACK TO BACK results! Possibly one of the earliest of what we call “Tarantino Slogs”, that’s somewhat of a misnomer here as Back to Back may be quite Tarantino-esque with the constant jawing of its characters in a crime comedy/drama scenario, but there’s nothing sloggy about it. One of the best aspects of the movie is its brisk and peppy pace, and the whole thing is quite freewheeling. And because it was the 90’s, back when movies were well-lit, you can actually see what’s going on. On the one hand, you have violent action scenes with plenty of gun-shooting and such. On the other hand, you have comedians such as Bobcat Goldthwait, Fred Willard, and Jake Johannsen making appearances, and the mix of the two is uneasy, let’s say. The two worlds collide in scenes where Bobcat is shooting cops with a machine gun. You won’t see that anywhere else, that’s for sure. Whether that’s a good thing or not is ultimately up to you. 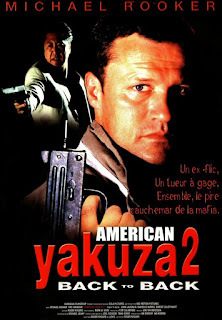 Interestingly, this was touted as a sequel or semi-sequel to American Yakuza (1993), and indeed it is known as American Yakuza 2 in many territories around the world. Apparently calling it that didn’t have much cache in the U.S., where it garnered the rather lackluster title it has here. 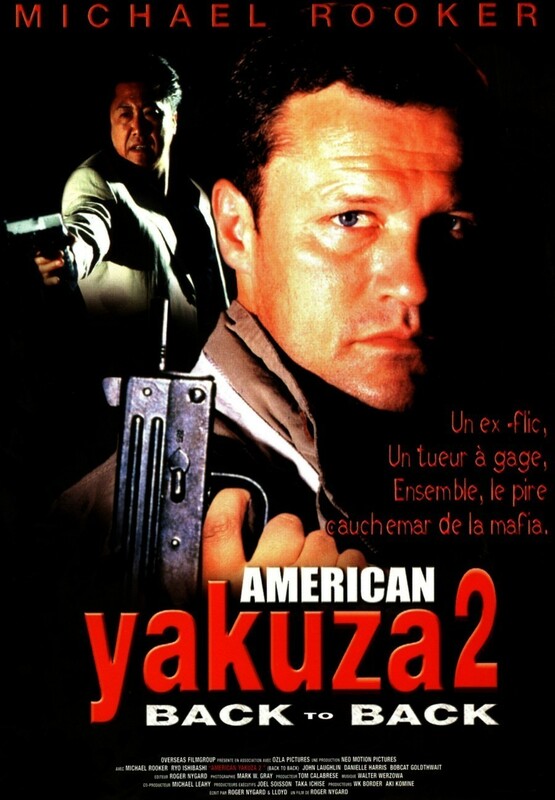 As far as we can tell, the only cast or crew member that made it over from American Yakuza 1 was actor Ryo Ishibashi, though he plays a different character in this one. His star power overseas must be big, as that’s a pretty tenuous thread to tie the two movies together. He has been in some things that have gotten some play over here, such as Miike’s Audition (1999) and Beat Takeshi’s Brother (2000), but he’s just one of many cast members on show here, competing for screen time with the likes of Fred Willard, Vincent Schiavelli, Tim Thomerson, Stephen Furst, and others. Fan favorite Michael Rooker gets not only a rare starring role, but an equally rare chance to show off his comedic chops. He also does action scenes well, so a lot was demanded of him here. His daughter, played by Danielle Harris, is almost the same character she played in the great The Last Boy Scout (1991). While that also was an action movie with humor, it had the power of Shane Black behind it. Back to Back, while entertaining, doesn’t have the depth, power, or quality writing of Boy Scout. But certainly fans of it would probably enjoy Back to Back as well, as they are cut from the same cloth. So, if you like spotting B-movie stars as they come and go in small roles, and you like your action with a heapin’ helping of laffs, by all means check out Back to Back. If you keep your expectations low – and don’t mind the whole Tarantino-esque thing - you will find some enjoyment here. This is a quality film, hits all the usual tropes. Thanks for dropping by. We agree on the quality level and it hits all the action notes to make it entertaining.